Fits on any sized bed. The SafetySure® Bed Cradle is ideal for individuals with paraplegia, pressure ulcers, burns, open skin sores, infections, or sensitive skin. 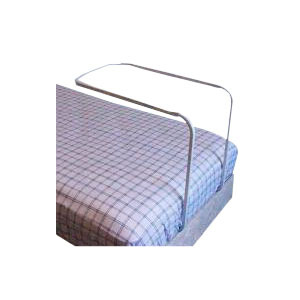 The Bed Cradle is a continuous closed loop frame of all steel construction. The lower end of the Bed Cradle slides between the mattress and bed spring at the bottom of your bed. The top portion of the Bed Cradle supports bed linens and blankets to keep them from directly lying on your feet providing pressure relief and increased ventilation. The Bed Cradle installs in seconds on any sized bed and requires no additional tools. Provides pressure relief by keeping bed linens off your feet. Improves ventilation to your feet.